Today's story is from Diana Meier-Soriat about how she combined her two passions. I started creating sketchnotes approximately one year ago. I became addicted to it and I can’t stop! Working as Social Media Manager in the Wine Import Company Ludwig von Kapff in Germany I soon started to combine my love of wine with my love of sketchnotes. I started off with simple wine tasting results in my Moleskine book and soon started to do some little doodles in the margins. In my nice Moleskine Wine Journal , I fill in all the information as well as little drawings here and there. My first serious project was a drawing for a wine label. The wine was a GrünerVeltliner from an Austrian Winery which was to be distributed exclusively in Germany. The Marketing Team had different ideas but not one that we all could agree was truly great. So what did we do? We decided to use the heart and soulof the winery itself: 3 men (the father and two sons) who create wines with passion and love. The simple drawingon the label shows Leopold, the father, and his two sons. The title “3 Haberer” can be translated into „3 guys“. It should be mentioned that “3 Haberer” is the Austrian term for 3 guys, a translation that perhaps not all Germans would understand. But the simple drawn label as well as the word “3 Haberer”is a perfect example of sketchnoting. It consists of the sketch as well as the words. This is all that defines the label. The result? Everybody knows the meaning. I am very proud of this project. It’s so much fun to see people buying and - above all - drinking this wine. You can tell that I’m passionate about wine - there are so many things that I can say about it. Once I did a very quick sketchnote about the basic types of wines. I don’t consider it to be very artful – in fact I just drew it in between doing many other things. So I was really surprized how many people on the web shared this work. Even the app paper53 featured the drawing!I felt very honoured. After this success describing wines with sketchnotes, we started to augment (“pimp”!) the wine descriptions with little drawings next to the bottles. People really loved it. 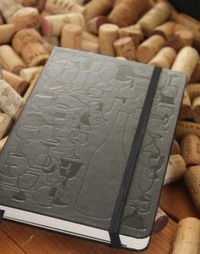 Now when we organize wine tastings, we often make little notebooks that people can browse while trying their wines. It is such a fun way to entertain them! We used this combination also for a very nice recipe booklet, where we offered recipes paired with the wines. As a nice team event, we even cooked at home for each other and added nice wine descriptions. It was so much fun and the combination of food, wine and sketchnotes was great. Sometimes I’m afraid that my work could be seen as a bit childish. But so far the response is quite the opposite. People are really happy about having something different and unique like the sketchnotes. We see this again and again. We are all "visuals". We love things made visual. Such a lovely story, Diana!